The Timber Rattlesnake is known as the Crotalus Horridus which is its Latin name, and is one of the most numerous species of venomous snakes in the United States. Although it isn’t considered to be a particularly great threat to people, it does have potent venom and has long fangs to deliver it, but the numbers of attacks on people are relatively few and far between. 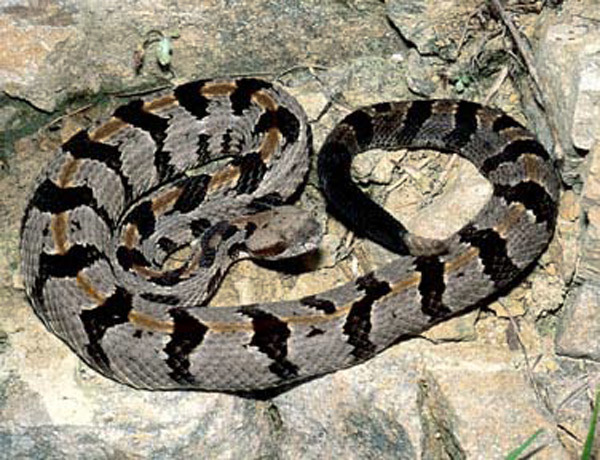 The species became an important symbol during the American Revolution, and in 2008 the state of West Virginia adopted the Timber Rattlesnake as its official state reptile. In the southern states, it's often called the Canebrake Rattlesnake. It does exist in Florida, but only in the very northern portions. The Timber Rattlesnake isn’t the largest in the rattlesnake family, with the largest example ever caught being just over six feet in length, and weighing in at around ten pounds. However, most specimens are much smaller, usually between three and five feet in length and weighing less than five pounds. In terms of the pattern that is showed on the body of the snake, it is usually an irregular striped pattern, with narrow dark bands alternating with lighter green-brown bands. Although the majority of these snakes do have a striped pattern of green or brown scales, there are many of these snakes that actually are much darker, and in some cases can be entirely black. The Canebrake rattlesnake will usually hunt at night, and is able to consume a wide range of different small animals depending on what it can find. The vast majority of the diet of the snake is made up of small mammals such as rabbits, squirrels and mice, although it is also known to feed on other snakes, frogs and small birds. One of the interesting aspects of the snake is that because it hunts at night it has an excellent ability to sense vibration, and even before it strikes at its prey it will know roughly the size of the approaching animal. The Timber Rattlesnake will strike its prey and inject the venom, and will then follow for the short period of time before it dies before swallowing the victim whole. The Timber Rattlesnake could be one of the most dangerous snakes in North America as it does carry very potent venom and also has large fangs, however it is generally quite docile when it comes into contact with people. It will generally use its rattle as a warning before striking, and is also known to feint a number of times to try and ward off a threat before actually striking. Because of its excellent vibration receptors the Timber Rattlesnake will often flee before even being noticed by people and will really only bite if there is no escape route and if it feels directly under threat. As a species the Timber Rattlesnake is quite successful and has a range over much of the eastern United States, ranging from Minnesota in the north down to Texas and north Florida in the south. Where possible it will prefer to live in deciduous forests and enjoys quite rugged terrain, although towards the south end of the range it will also be found in marshy areas. They are more commonly found in areas with a variety of terrain, preferring locations that have exposed rocks and logs for basking but also close to areas with dense leaf litter or crevices for hiding and cooling. The mating season for the snake will generally happen during late summer, although this may actually happen earlier in the northern end of its range, beginning in July and continuing until the end of August. Where there is more than one male looking to breed with the female they will engage in wrestling matches for the right to mate with the female. It is known that the female can hold the sperm within their bodies for up to a year, and will then fertilize the eggs the following year, usually giving birth to a brood of between six and fourteen young snakes that will be between eight and ten inches long. The Timber Rattlesnake is one of the most long-lived species of rattlesnake, with snakes often living for over twenty years. The young snakes will only remain with the mother for a short period before being left to survive on their own, as they are born with fangs and venom already present. The growth of the snake is actually quite slow, with males reaching adulthood after around four years, while the females become sexually mature between seven and eleven years after being born. However, reaching sexual maturity is not necessarily a sign that they will mate, as the females will only carry three to four litters of young in her lifetime. Because of the relatively long period between reproductive seasons and the long growth period, the Timber Rattlesnake is prone to populations being decimated if their habitat is changed or developed, and it can take a long period for the population to recover. These young snakes will grow gradually for the first two years, and are independent from birth. They will usually grow into their sexual maturity in their second year. Unfortunately there isn't a large amount of research in terms of their lifespan in the wild, but those kept in captivity have lived up to twenty years, though those in the wild are likely to live for a much shorter time than this. If you are interested in trapping snakes for removal or collection, click the below banner to buy one of my professional snake traps. Easy to buy - arrives in 2 or 3 days.